At the end of April, Wiki Education staff traveled to Toronto, Canada, to participate in two conferences with open education themes: the William and Flora Hewlett Foundation’s Annual OER Meeting and the Creative Commons Global Summit. Both conferences confirmed the work Wiki Education is engaged in is crucial to the future of open education, especially in regard to the newer field of open educational practice. Executive Director Frank Schulenburg and Research Fellow Zach McDowell joined me at the Hewlett OER Meeting, which was themed around equity. Each participating organization was asked to give a two-minute lightning talk about how their work informs equity. I talked about how Wikipedia’s gender gap leads to content inequity, with topics like military history and video games being well covered, while article quality in areas such as feminism or literature lag behind — and about how Wiki Education is working to change that through our open educational practice, especially our partnership with the National Women’s Studies Association. For me, equity is about more than just enabling access to open educational resources (although certainly that work is important too!). At Wiki Education, we promote equity by engaging underrepresented communities to write the content on Wikipedia, the world’s largest open educational resource. Our work specifically addresses topics that aren’t covered due to systemic bias, and asks experts in those fields to engage in the open educational practice of filling those content gaps. I continue to be inspired by our work to address equity. 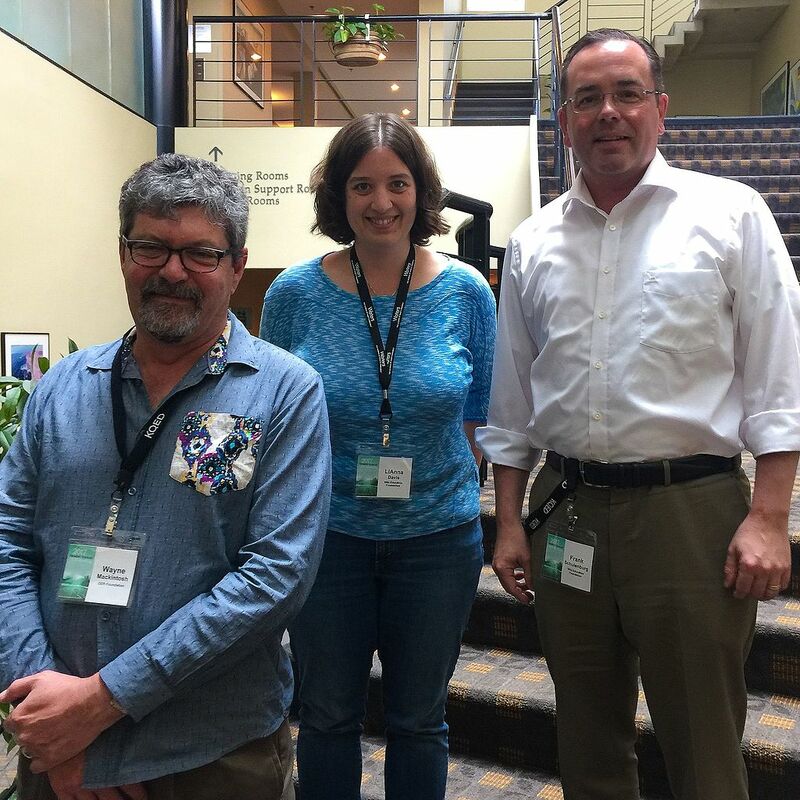 LiAnna and Frank with Wayne Mackintosh at the Hewlett Foundation’s Annual OER Meeting. Participating in the OER Meeting also gave us the opportunity to connect with other organizations who have received grants from Hewlett, as we have. In particular, we had fruitful discussions with Amin Azzam, who has partnered with us to create recruitment videos, and who is currently engaging with us and Osmosis in a Hewlett-funded project to create a video on how to edit medical articles for medical students, and with Bob Cummings of the University of Mississippi, who teaches in our program in addition to serving on our board. We also had the opportunity to re-connect with Wayne Mackintosh, who worked with Frank and me (as well as Bob!) on the Advisory Board for the pilot of our program, back in 2010. From the Hewlett meeting, Zach and I moved on to the Creative Commons Global Summit, where we ran a session on how our program engages students in open educational practice. Zach presented initial results from his research project highlighting the specific motivations students have for participating in an open peer production community. We facilitated small group discussions among the very engaged audience around how they can apply our learnings to their own open spaces. In addition, we participated in a group looking to develop the Creative Commons Open Education platform, which includes open educational practice. The CC Summit organizing team did a fantastic job of bringing in some truly excellent keynote speakers. I particularly enjoyed Ashe Dryden’s talk about building diversity into open communities, pointing out issues of implicit bias. Wiki Education has spent a significant amount of time creating an environment for our student editors that is inclusive. Also relevant to our work was Sarah Jeong’s keynote about the fake news phenomenon, in which she laid out the rationale that Facebook is destroying democracy, since its end goal is profit rather than informing people. While I agree it’s bad to turn over our sources of information to advertising-motivated social networks like Facebook, I also think teaching students information literacy skills is actually a longer-term solution. Finally, Hillary Hartley gave a great talk about open technology practices that had great parallels to what we do with open educational practices. Both conferences were very affirming that the work Wiki Education is doing in the open educational practice space is really important. Thank you to the organizers for interesting and engaging conferences. I just read the newest WikiEd blog and remain concerned about the gender gap related to Women’s health issues. Feminism is fine, but ideologies pale in comparison to providing men and women with the ‘plain-language’ information related to their own health and bodies. You can have all the feminist-related articles you want, but when a woman needs non-commercial information on her own body, it is Wikipedia that should step up. There are very few editors that edit in this area and it is troubling. Women’s health is absolutely an area I’d like to see more people contribute to, and we’d love to help facilitate that. One reason not many classes in our program edit health/medicine articles is because, well, it’s harder than most other areas of Wikipedia. In fact, based on our past experience, we typically only recommend it for medical students (and not typically undergraduates, who have a bit more trouble when it comes to MEDRS and MEDMOS). That said, there are some exciting things in the works with WikiProject Medicine and Osmosis, who collaborated on a Hewlett Foundation grant to help medical school faculty incorporate Wikipedia into their classes. If there are other ways you think Wiki Ed could help to facilitate the improvement of women’s health articles, let me know — perhaps at the Pitt Medical School, or I could put you in touch with someone working on the Hewlett-funded project.